Blaster pistol (4D), sealed flight suit, comlink, toolkit, X-wing fighter. Parents died fighting a fire on the space station they lived on; he revenged them by killing the pirates that started the fire. As he grew older he bought his own ship and tried to start a business as a respectable trader but went broke. He soon joined the Rebel Alliance as a gun smuggler and eventually flew an X-wing in the Battle of Yavin. As one of the few pilots to survive, Wedge went on to become one of the Alliance's greatest heroes. 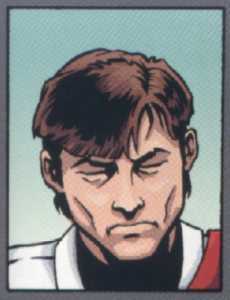 By the Battle of Endor, Wedge was the leader of the infamous Rogue Squadron. After the conflict with Warlord Zsinj, Wedge accepted the rank of General.